Is the Ping Buddy Supported? 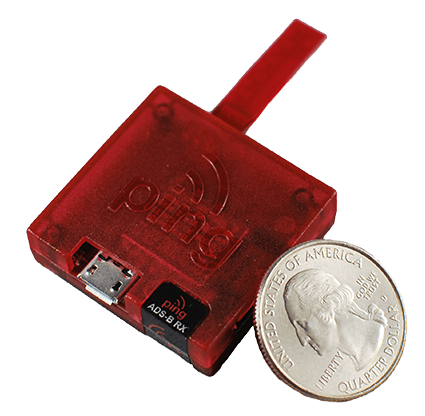 pingBuddy is the world’s smallest and lightest Wi-Fi ADS-B receiver. It features internal Wi-Fi, dual-link ADS-B In, and built-in antennas. pingBuddy brings real-time air traffic reporting and weather updates to your Electronic Flight Bag (EFB) of choice. Simply power pingBuddy, join the wireless network and load up your EFB software to view surrounding aircraft and flight information. It looks like it will be compatible based on the marketing materials, but I've sent them an email to get a definitive answer. I'll post back here when I receive a reply. Update: I've received a response from uAvionix and it looks like it should work without any problems. I have a friend who is currently using one with Naviator on a Nexus7(v2013) at the same time he is running a stratux with his panel mounted IFly740. He won it by dropping his card int he bowl at Oshkosh! Anyway, he says it works fine and is quite surprised that the tiny fractal antenna works as well as it does, but he is flying a plastic Vari-Eze. He did mention  that the stratux with a real weighted 1/4-wave antenna gets better reception, and  that the little PingBuddy draws much less power than the RPi, and does not get hot.